Photograph recovered during initial containment, context unknown. Special Containment Procedures: SCP-2592 is housed in a standard humanoid containment cell at Humanoid Containment Site-06-3. In lieu of a standard humaniform entity diet, SCP-2592 is to be fed one bowl containing two sliced Class I (EU) bananas in 350 mL of whole milk daily. Only personnel testing at an extrasensory resistance index of 65 or higher are allowed within SCP-2592's containment area, and only with prior permission from at least one Level 3 Senior Researcher. Personnel experiencing unusual headaches, hallucinations, or nosebleeds are to exit the containment area immediately and undergo mandatory mind-affecting / memetic hazard quarantine. Description: SCP-2592 is a thin humanoid entity 157 cm in height and 42kg in mass with rudimentary telepathic capabilities, recovered on █/██/1923 from a beach home near [REDACTED], France. SCP-2592 is intelligent and can understand simple phrases and words in French, but does not appear to be capable of speech. Due to its lack of eyes, SCP-2592 navigates its surroundings primarily using touch, but can telepathically detect the presence of human subjects within a range of approximately five meters. SCP-2592 has not shown any indication that it is capable of telepathic communication or thought-reading, but has sometimes responded to strong emotional states such as fear or distress. If allowed to, SCP-2592 will attempt to groom non-threatening human subjects by brushing and/or braiding their hair, using basic tools such as combs and brushes if available. When left alone, SCP-2592 will either pace listlessly or lie in a fetal position. 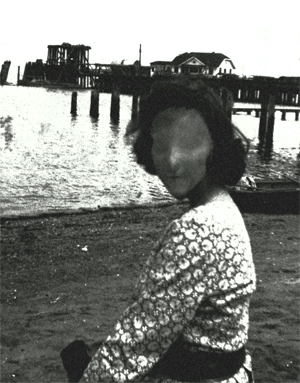 Subjects within ten meters of SCP-2592 have consistently reported receiving hallucinations consisting of mental imagery consistent with that of the beach near the home in which it was recovered as well as the sound of gently crashing waves, which have been consistently described as "serene", "peaceful", or "relaxing". When startled or frightened, SCP-2592 is also capable of generating intense telepathic emanations that cause panic or severe pain in nearby human subjects and can lead to significant neurological trauma after prolonged exposure. SCP-2592 was discovered in a residential home belonging to [REDACTED], a blind 58-year old widow living alone. A local milkman had become concerned following several consecutive days in which she had failed to receive delivery and notified local authorities. Upon forcing entry into the home, SCP-2592 was discovered in a distressed state in an apparent attempt to protect the body of [REDACTED], who was later determined through autopsy to have been dead for several days as the result of a stroke. Six (6) police officers were injured by SCP-2592's telepathic distress response during the ensuing chaos. The Foundation was notified by regional authorities and dispatched a containment team to the home. Still in a distressed state from its prior contact with local authorities, SCP-2592 incapacitated several members of the containment team before Containment Specialist de Villiers, having taken stock of the composition of refuse within the home, managed to calm SCP-2592 by offering it several bananas and a bottle of milk. SCP-2592 immediately ceased its distress response and became docile, after which Foundation personnel managed to secure it for transport to the nearest containment facility. A thorough search of the premises turned up a single photograph but no additional evidence relating to SCP-2592 or its origin. Containment Specialist de Villiers was awarded the Foundation Star for his bravery and quick thinking that led to the safe recovery of an anomalous humanoid entity and for saving the lives of several members of his containment team.